Hospitality Management prepares individuals to serve as general managers and directors of hospitality operations on a system-wide basis, including both travel arrangements and promotion and the provision of traveler facilities. Includes instruction in principles of operations in the travel and tourism, hotel and lodging facilities, food services, and recreation facilities industries; hospitality marketing strategies; hospitality planning; management and coordination of franchise and unit operations; business management; accounting and financial management; hospitality transportation and logistics; and hospitality industry policies and regulations. What kind of students major in Hospitality Management? Students interested in Hospitality Management or hospitality administration must be interested in management, generally, but have a special interest in the growing service industry. Good person-to-person communication and general people skills are a must for effective leadership and managerial positions. Students in this major will also take many courses that apply for a business major as well. Bachelor’s Degree or Some College usually needed for this career. A MS or PhD would be required if you wish to conduct field research or become an educator, but this is not required for career practitioners in the private sector. What courses do most students take in college? The required and elective courses you would take for Hospitality Management majors vary considerably among institutions. Courses are listed here that are illustrative of the breadth of topics you are likely to experience were you to major in this field. What are your future career options as a Hospitality Management Major? What does a Hospitality Manager do in their day to day career? Plan menus and food utilization based on anticipated number of guests, nutritional value, palatability, popularity, and costs. Assess staffing needs, and recruit staff using methods such as newspaper advertisements or attendance at job fairs. 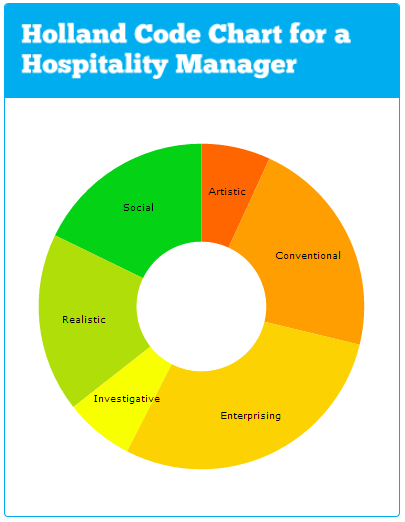 What work activities are required of most Hospitality Management? Training and Teaching Others – Identifying the educational needs of others, developing formal educational or training programs or classes, and teaching or instructing others. Getting Information – Observing, receiving, and otherwise obtaining information from all relevant sources. Performing for or Working Directly with the Public – Performing for people or dealing directly with the public. This includes serving customers in restaurants and stores, and receiving clients or guests. Guiding, Directing, and Motivating Subordinates – Providing guidance and direction to subordinates, including setting performance standards and monitoring performance. Resolving Conflicts and Negotiating with Others – Handling complaints, settling disputes, and resolving grievances and conflicts, or otherwise negotiating with others. Communicating with Supervisors, Peers, or Subordinates – Providing information to supervisors, co-workers, and subordinates by telephone, in written form, e-mail, or in person. Coaching and Developing Others – Identifying the developmental needs of others and coaching, mentoring, or otherwise helping others to improve their knowledge or skills. Monitoring – Monitoring/Assessing performance of yourself, other individuals, or organizations to make improvements or take corrective action. Administration and Management – Knowledge of business and management principles involved in strategic planning, resource allocation, human resources modeling, leadership technique, production methods, and coordination of people and resources. Production and Processing – Knowledge of raw materials, production processes, quality control, costs, and other techniques for maximizing the effective manufacture and distribution of goods. Education and Training – Knowledge of principles and methods for curriculum and training design, teaching and instruction for individuals and groups, and the measurement of training effects. Personnel and Human Resources – Knowledge of principles and procedures for personnel recruitment, selection, training, compensation and benefits, labor relations and negotiation, and personnel information systems. Sales and Marketing – Knowledge of principles and methods for showing, promoting, and selling products or services. This includes marketing strategy and tactics, product demonstration, sales techniques, and sales control systems. Food Production – Knowledge of techniques and equipment for planting, growing, and harvesting food products (both plant and animal) for consumption, including storage/handling techniques. Public Safety and Security – Knowledge of relevant equipment, policies, procedures, and strategies to promote effective local, state, or national security operations for the protection of people, data, property, and institutions. Transportation – Knowledge of principles and methods for moving people or goods by air, rail, sea, or road, including the relative costs and benefits. Stress Tolerance – Job requires accepting criticism and dealing calmly and effectively with high stress situations.